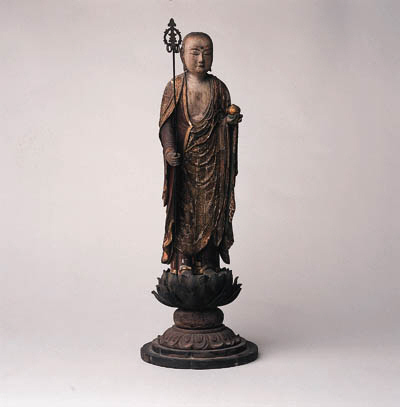 Jizo Bosatsu had been worshipped since the Heian period, particularly as the protector of children. He is represented wearing rich brocade robes with a white face and bearing a hoju [sacred jewel] in his left hand to illuminate the darkness of hell, and a shakujo in his right hand. The supporting lotus pedestal symbolises the purity of Buddhism.